Hadoopoopadoop, Time and Material, and Sculpture in Our Time are by me, Peter Coates, a longtime software engineer and sometime artist (more about that below.) Just lately, I’ve been concentrating on making art, but that’s coming off a few years doing big data in New York with the Hortonworks Hadoop platform. Now I’m getting deeper and deeper into the Internet of Things world, with a new startup out of France so the art may slip into the background again. This new gig will still be big data, and Hadoop will no doubt be in the mix, but it’s going to be a whole new constellation of technologies: The AWS IoT platform as well as AWS’s more conventional services, IoT devices, and all kinds of interesting protocols and hardware. It’s going to be fun! Hadoopoopadoop has a pro-Horton bias but I don’t speak for Hortonworks in any capacity, so please assume that any mistakes or crackpot opinions are my own. Most of what you’ll find in the blog concerns basic core Hadoop but HDP is a big distribution with many other components including HBase, Storm, Kafka, Atlas, and Ranger, to name just a few. There are also some articles on non-Hadoop big data projects I’ve done. Sculpture Wiki is a manual on stone carving techniques, tools, aesthetic issues and history, basically, a giant how-to on stone sculpture. Not just the mechanics but also the aesthetics. Figurative sculpture in stone is out of fashion and a lot of the aesthetics have been forgotten. Elements that are specific to the book or the Web page can be tagged for appropriate handling. Once the document is fully marked up, subsequent changes to the content automatically appear in both—there are no extra steps to issue the book, which is generated as a PDF document. I plan to try publishing it in an edition of one using the Espresso book printing machine at Shakespeare and Co.
Sculpture in Our Time is articles about aesthetics. It’s not updated much and I’m going to merge it into one of the others. Time and Material is my place for general essays and comments: politics, love, making things, whatever. I’ve also written about books for the now-dormant The Second Pass. This was a brilliant site—all about giving books a second look after the publication buzz is over. A hundred years old, or three years old. I wish John Williams would turn it back on. Below are some more samples of my work in the plastic arts. They are presented in approximately chronological order, with the first five and the cows at the top of the page being from the last year or so. All of the dark-grey sculptures are painted wood. It’s hard to tell what they’re made of even in person. They look like they’re carved out of blackboards but it’s just painted wood. Piglet, painted wood, 2017. approximately life-size. Lamb, painted wood, 2017, approximately life-size. These animals in the round are a departure for me. Until this year, I’ve mostly carved bas relief panels. But I’m getting into sculpture in the round. Chicken, painted wood, 2017, approximately life-size. Goat, wood, 2017, approximately life-size. The young woman below was the subject of several pieces, a couple of which are shown here. She’s imaginary–nobody in particular, not even photos. Brooklyn was a great place before it got so fashionable. I met this kind of rough-looking guy on the street one day, and we started talking and it came up that he was a sculptor. I figured, yeah, yeah, he pastes found crap together and calls it art. But no, he meant a real sculptor–he’d carved figures on the Cathedral of St John the Divine. We got to be friends and he ended up selling me a ton of this beautiful white, very hard Carrara marble. Literally a ton. He’d gone over there and bought ten tons–enough to fill a shipping container. It was all fag ends from a tile factory. Big chunks, but too small for the slicing machines, so they sold them cheap. He shipped it back to the US, sold half to pay off the expenses and kept the rest for himself. But he still had a ton left and rent to pay. With this piece and a couple of other little pieces, I guess I’ve got about another 1900 pounds of it to carve. This was just a little broken off hunk. Girl, marble, 2015. This is about 2/3 life-size. 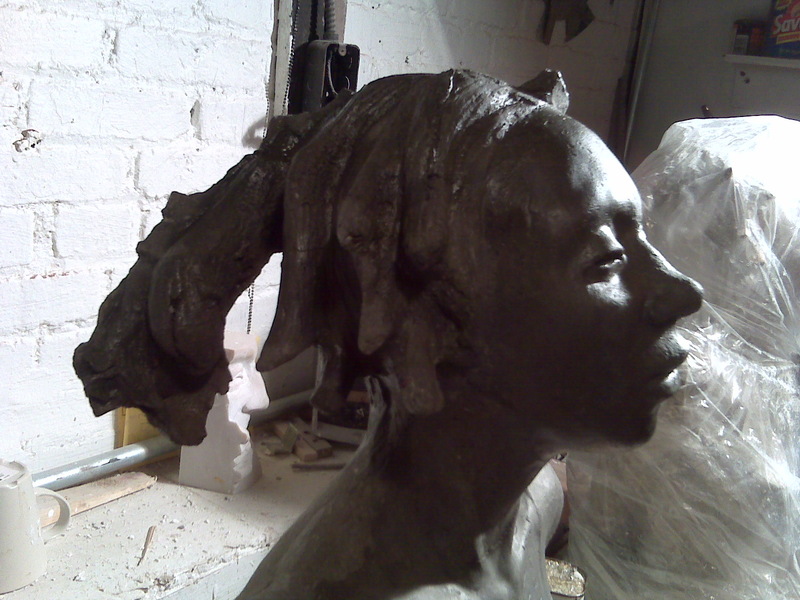 Club girl, concrete, 2012. About 2/3 life-size. The boys and I lived in a falling down ruin in Brooklyn that I had used variously as a studio, junkyard, and apartment for many years. Their sister grew up before we lived there when it was still just a studio, so she never actually lived there, but I was vaguely aware of my keys going missing from time to time. There’s a reason nature degrades your vision and hearing in middle age. 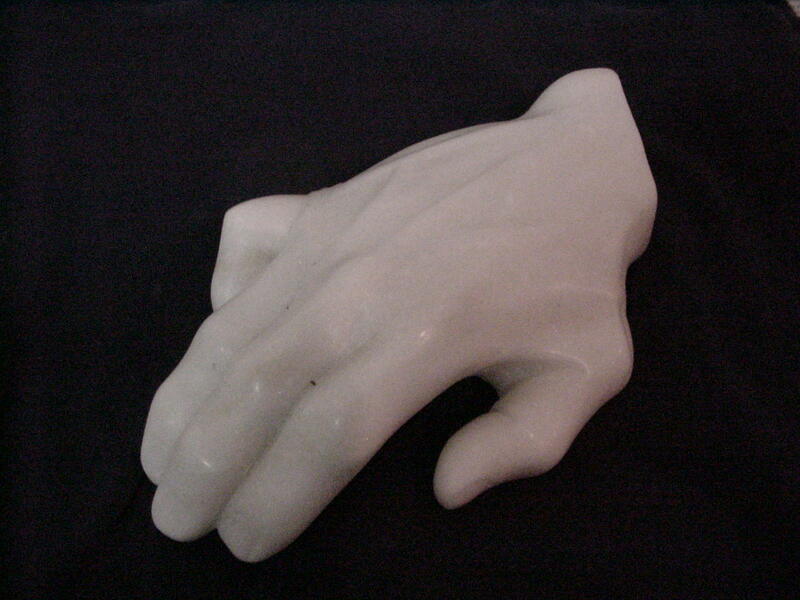 This hand started out as one of half a dozen rectangular pieces of marble that my oldest boy pulled out of a trash dumpster and deposited at the studio thinking they must be good for something. So I got some stone chisels and started carving stone. You can get started with $25 worth of tools. I think this was the second piece. It’s not that different from wood–you just have to adjust your pace a little. In some ways, it’s easier than wood, actually. The middle son. He works on chess-playing engines now and imagines I have any idea what he’s talking about when he brings up data science. 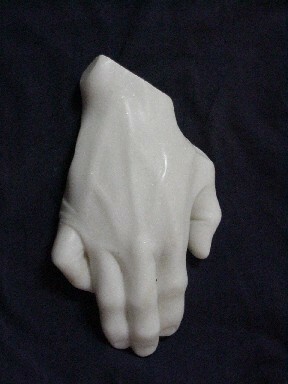 c. 2004 Concrete, life-size. This is my son Dodge at age 10 or 11.
c. 1988 Painted wood, app. 1.25x life size. The image was lifted from a magazine photo. The colors is off a little. They’re all the same paint–they’re the same charcoal gray as the pig at the top of the page. c. 1988 Painted wood, app. life-size, also lifted from a magazine photo. I did scores of paintings in this format— 18-inch square oils on canvas. There are only a handful left now, and I think I only have a couple. They burned up in fires, got lost in floods, tossed out by mistake, lost in moves, swiped by roommates. Time and chance happened to them all. c 1986 Oil on canvas, 18″x18″ This was one of the scores of paintings in the same format. I’ve been making some tools for stone and wood carving lately. It’s not something I do for itself–they’re strictly for use, but some of them are interesting. Carving tools are one of those rare things you can make yourself that are potentially better and cheaper than store-bought. A few of the small ones have cutters or handles salvaged and/or modified from other tools, but most of them are hand-made. The beige handles are all sycamore (e.g. plane tree) wood turned on a lathe with brass tubing for ferules. Most of them are 01 tool steel, which is fairly easy to work and heat treats easily but one of the scorps started life as a mill file. Except for the lathe work, the metal working is all incredibly basic–if you carve, you should try it. All it takes is the steel (you can order it online) plus a hacksaw, file, grinder, and water or oil stones for sharpening. Once you’ve made a couple you can knock one out in a couple of hours. The axe with the points is for stone. It’s modeled on one in Vasari’s 16th C. treatise on art technique. I’ve never seen one in real life so a real one is definitely a novelty. It’s cut and ground out of an old carbon-steel half-hatched head, then heat treated and fitted with a store-bought handle. I’ll eventually turn one but the store-bought one was handy. The other one is done on a lathe from a ball-peen hammer head like the one shown with it. The points are of 01 tool steel heat treated for stone. They’re seated in holes bored in the hammer and secured with cotter pins so they can be replaced. I’m going to try making a couple with carbide tips brazed on. The small adze above is strictly for wood. The handle is carved out of glued-up red oak from a scrap of shelf board and the blade is 1/8″ 01 tool steel. It’s screwed on with an array of screws. Now that I’ve seen how well it works, there are some variations in the offing. I’m thinking one with a gouge would be useful.